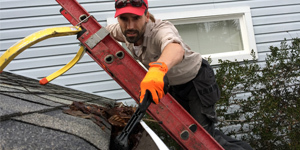 Your Demossing experts servicing out of Shawnigan Lake and Mill Bay to the surrounding areas of the Cowichan Valley, Greater Victoria, Duncan and Sidney. Cleaning all exteriors, from the top of your roof to the end of your driveway. 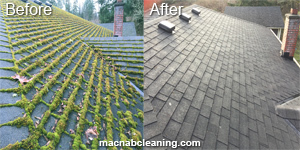 MacNab Exterior Cleaning is a professionally run local operation for moss removal and the cleaning of all residential and commercial property exteriors. First of all, for the best demossing results, we follow the Asphalt Roofing Manufacturers Association recommendations. Especially relevant is our exclusive training from Bruce Sullivan of Sullivan Cedar Roof Cleaners to give you the best possible cedar shake roofs. In addition to proper training and professional equipment we have years of experience with 1000’s of happy clients as a result. For all types roofs and exterior surfaces, we use environmentally friendly solutions. 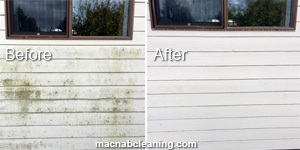 Furthermore we treat and clean all home and building exteriors, freeing them of ugly mold and algae from the root up. And more… we do it all. So give us a call, Shawn and Christine are eager to assist you. 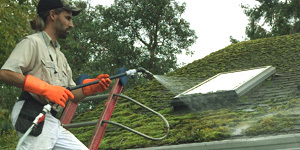 Clean your roof from moss and algae and make it look like new again. We are the experts in exterior window washing. Commercial and residential. Maintain the exterior of your home or business and look after your reputation. Keep those gutters flowing and shining bright. We’ll take care of the leaks! Shawn cleans stuff. And is really awesome at it. Fully insured, licensed, bondable and highly experienced. He has a long list of happy clients, and always ready to make more. Christine is the PR, grounds technician, director, admin, book keeper, and so much more. You want service? You got service, girl. *Only full day appointment bookings available during our busy season. **Currently booking for July appointments and onward.